Isis, the carrier-led joint venture between AT&T, T-Mobile and Verizon, is today announcing support for its mobile wallet system from the majority of leading device makers, including HTC, LG, Motorola, RIM, Samsung and Sony Ericsson, as well as from NFC hardware provider Device Fidelity. All of the handset makers are now committed to introducing handsets that will include Isis’ NFC and related technology standards. 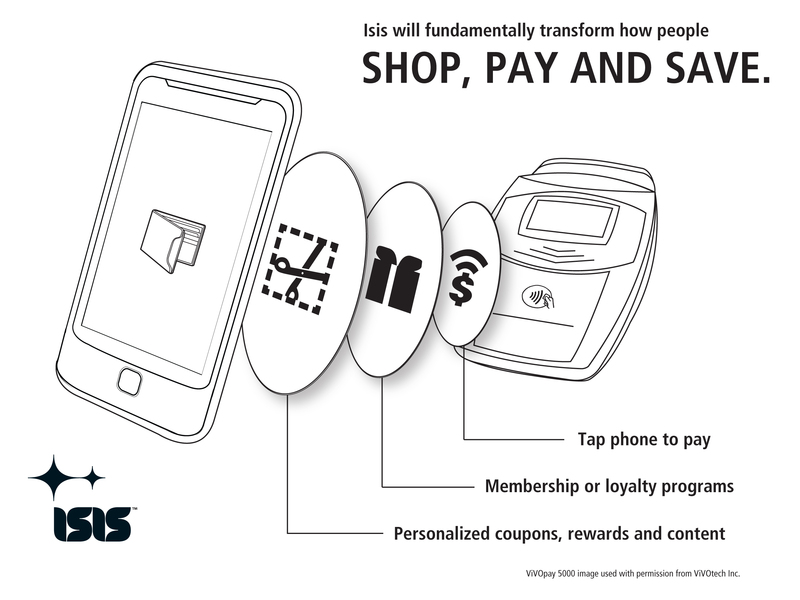 Isis represents the carriers’ attempt at inserting themselves into the mobile wallet and mobile payments space in order to compete head on with other mobile wallet providers, including those from credit card companies, banks and platform providers, like Google with its Google Wallet program for Android handsets. The technology in Isis’ mobile wallet uses NFC, or “near field communication,” which enables short-range wireless transactions at point-of-sale. Instead of swiping a credit card, consumers will be able to simply tap or wave their phone at the payment terminal at checkout in order to complete a transaction, and in some cases, even receive coupons or offers from the merchant. NFC forecasts vary, with ABI Research estimating 35 million handsets shipped this year, and double that next year. IHS iSuppli has forecasted nearly 550 million handsets by 2015. Meanwhile, Berg Insight AB expects there to be 400 million by 2015. Whatever the true number may be, the consensus is that the technology is years out from consumer adoption. However, the launch of the Apple iPhone 5 is right around the corner, and it will be a key turning point for NFC’s future, potentially shaking up those analyst estimates. If the iPhone 5 does not include NFC support, then adoption of NFC will lag. If it does offer NFC, the movement will continue its current forward momentum, and likely at a faster pace. Today’s news from Isis supports the latter theory, given its seemingly reactionary nature. If Apple is moving forward with NFC, competing handset makers would have no choice but to also participate by offering NFC support in their handsets as well. That support doesn’t necessarily have to include a partnership with Isis, of course, but Isis is one of the leading movements in the space. As for DeviceFidelty, it’s no surprise to see it also officially named as one of the companies powering the Isis mobile wallet, given its position as a leader in contactless technologies, including NFC. It’s also interesting to hear this news now, when just yesterday, disruptive mobile payments company Square’s COO Keith Rabois boldly declared NFC as having no value, citing lack of merchant interest in the technology. The “merchant adoption” hurdle is valid, of course, but contactless infrastructure is already in more locations than consumers may realize, even if it’s somewhat underused. As of this spring, for example, MasterCard claimed it had approximately 88 million PayPass cards (contactless credit cards) and devices in use at 276,000 merchant locations, plus trials and rollouts underway in 36 countries, including at fast food restaurants like McDonald’s, KFC and Taco Bell, plus retailers like Sports Authority, Best Buy, and gas stations like BP and Hess. Visa offers a similar contactless support through payWave, with over 150,000 merchant locations in the U.S. and over 300,000 locations worldwide. Contactless infrastructure is an important part to NFC’s adoption because NFC is based on the existing contactless infrastructure around the world. In other words, where there’s contactless support, there can be support for NFC too. This is, of course, assuming that the device in question offers “card emulation” mode, which lets the NFC device behave like an existing contactless card. But that’s the most logical onramp in the contactless to NFC transition, so that will likely be the case with most mobile wallet initiatives. Correction: The article originally referred to Visa’s service as “In2Pay,” but that’s its smartphone case that brings NFC to iPhone. Visa’s NFC payment technology is “Visa payWave.” Visa also provided some numbers regarding the service, which were added.